In the ever-changing world those who succeed never stop learning. The American Society for Training and Development found that companies that offer comprehensive training have 218% higher income per employee and a 24% higher profit margin than those who pay less attention to training. Cloud-based learning management systems (or LMS) are an effective tool for enhancing team productivity, empowering employees’ learning and development, and cutting training costs while keeping everybody connected and engaged. It is no wonder that the LMS market size is predicted to grow to $15.72 billion by 2021. Recently, G2 Crowd has published a list of twenty top-performing corporate LMS software products that were chosen based on customers reviews. We are happy to share that Rallyware has been selected as one of the leading learning systems of 2018. It’s clear that it will take some time to research the most suitable LMS product, since each comes with a list of options and specific features. Keep in mind that your choice of an LMS vendor should not be based on the bells and whistles that come with a platform. You have to find one that focuses on your specific business needs and goals to help your company grow. Litmos LMS is a cloud-based learning system with mobility in mind. This platform is used by over 5 million users in more than 130 countries. Litmos platform unifies virtual, classroom, mobile, social, and eCommerce capabilities to meet organizations’ performance and productivity needs. The learning system is a perfect fit for companies looking to complement their existing communication, engagement, and other operational tools. Product scores are based on real-time data from verified user reviews on G2 Crowd. LearnCore specializes in sales enablement and video coaching to solve common training challenges for large and growing organizations. This LMS is effective for onboarding and retaining sales reps, identifying top performers, and providing consistent communication across sales teams. Looop is a learner-centric platform that makes training available on demand. Companies like ASOS, Sky, and Discovery Channel use Looop to train their employees. Besides quizzes, tracking employees’ progress, and quick content sharing, Looop also helps to schedule and manage face-to-face events. Lessonly is an LMS platform that puts people first and helps companies build favorable company culture with the right training. It is used by over 500 sales and support teams to transform work knowledge, engage the workforce, enhance employee performance, and measure the business impacts of team learning. TalentLMS is a user-friendly LMS with a responsive design for the effective training of employees, partners, customers, or students. It offers strong support for SCORM & TinCan (xAPI), notifications, course selling, video-conferencing, gamification, and the like. WorkRamp is a training solution for onboarding, training and certifying employees. Its team believes in enablement as a key driver to success. They will assist you in enabling your sales teams, partners and employees to create a positive customer experience. WorkRamp has worked with companies like General Electric, Cisco, and P&G. Panopto is a video platform for training, teaching, and presenting. Its platform is an effective educational assistant that is used by leading academic institutions, including Stanford and Oxford, and businesses to capture lectures, live stream events, and share their videos through a YouTube-like portal. Pluralsight is an LMS platform that helps businesses train employees and close skills gaps in critical areas like cloud, mobile, security, design, and data. This platform helps to evaluate current knowledge through skill assessments and analytics and then helps to choose among more than 6,000 courses made by technology experts. Skillport is a cloud-based learning and performance support platform. It offers thousands of videos, books, courses, as well as rich certification training to support critical business operations and provide continuous learning and leadership skills development. Mindflash is a cloud solution that makes training a strategic force that drives your business. It allows users to easily upload any PowerPoint, Word, PDF, SCORM or video files and create an online course that can be taken on any computer or mobile device. Mindflash is used by organizations like Apple, Dyson, Microsoft, and Uber. JoomlaLMS is a multifunctional learning platform that allows users create media-rich courses and control their display. With an uncluttered interface, it’s easy to work with SCORM and AICC compliant, iOS and Android Mobile apps, reports, data import, quizzing and testing. For this reason, JoomlaLMS was chosen by over 1,000 businesses in 30 countries. Totara Learn is an open source learning platform used to educate, manage and connect employees. It doesn’t have licensing fees and delivers software freedom to innovate, integrate, and expand. Among Totara Learn clients are companies like Sony, Sky, Kia, and JetBlue Airways. Bridge LMS is people-centered capital management suite for businesses. Its platform is designed to promote forward-thinking strategies, actionable analytics, and employee development. Bridge also partners with Arc Video platform and provides data to improve the impact of your video learning. LearnUpon is an easy-to-use LMS platform trusted by over 800 customers worldwide, including Armstrong, Yokohama, Allstate, and Vauxhall. It delivers non-sequential learning paths with options to quickly create exams, surveys, assignments, webinars, and instructor-led training (face-to-face or classroom-based) sessions. SkyPrep is a learning platform that simplifies the task of internal training by allowing for organizations to easily transfer, automate, and scale training programs, whether it be training for compliance, onboarding, professional development or client-facing training. SkyPrep is used by organizations like YMCA, Buffalo Bills, and Peoples Trust. ThinkHR is a cloud-based LMS that leverages trusted knowledge, human expertise, and innovative technology to help organizations deploy HR best practices. Armed with more than 200 courses, ThinkHR provides online training to ensure compliance, reduce risk, and drive employee engagement. Grovo is a microlearning solution that combines smart, intuitive technology with a world-class microlearning library to empower people with the latest skills and knowledge. Founded in 2010, Grovo has helped such companies as PepsiCo, InterContinental Hotels Group, Magellan Health, and the National Basketball Association. Halogen TalentSpace is a cloud-based talent management suite with more than 4,000 customers and 33 million users across 195 countries. Its main goal is to deliver a continuous development experience–from personalized training and collaboration to real-time coaching, goal setting, and feedback. LearnDash is a flexible LMS built on WordPress that empowers learning programs for Fortune 500 companies, major universities, best-selling authors, and “solo-preneurs” across the world. It offers an intelligent course builder, advanced quizzing, certificates, and dynamic forums for engaging training. Each learning platform offers a rich choice of must-haves for growth and business success. However, all LMS solutions differ by pricing, functionality, areas of specialty, user experience, integrations, and more. So make sure you have a good understanding of what kind of LMS your company needs to help you reach your talent development and company growth goals. 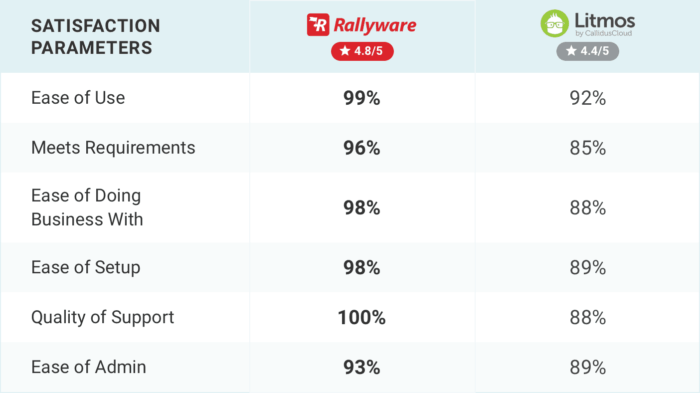 You can find more reviews or share your Rallyware experience on G2 Crowd’s Rallyware review page. And if you are still unsure which LMS could be the best fit for you, don’t hesitate to request a personalized demo to see first-hand what the training must-haves are for a company like yours.